While Manual soldering is still done today, it is usually not found in a production environment because it involves highly skilled and labor intensive work producing very low numbers of boards. Dip and Drag were introduced many years ago as lower cost alternatives to Wave soldering, but have become outdated forms with the advent of more affordable and highly accurate Wave systems. Today, Wave soldering is the most common and most efficient form of throughhole soldering available. It involves a solder pot large enough to handle the width of the largest boards you expect to process. By pumping hot solder through a nozzle in a way that the bottom of the board surface encounters the wave caused by the nozzle, the resultant hot solder waterfall creates a single point of contact across all the connection joints on the board, eliminating any potential bridging. The system usually integrates a fluxing station, a pre-heat station, and a wave station in a conveyorized system, using fingers or pallet-type board mounts. 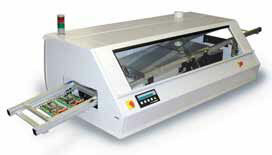 Check out DDM Novastar's wide range of Wave Soldering Machines. The first step in selecting a Wave system is to identify the largest board size (length x width) the machine will be expected to process. This will determine the machine size and, just as importantly, its cost, from a benchtop unit handling 8” boards (starting in the $10,000 range), up to free-standing machines with capacities up to 24” using a very large solder pot (costing as much as $80,000 or more). 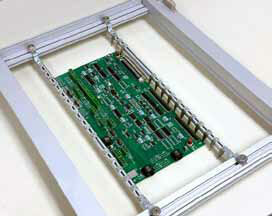 The larger sizes will also accommodate much more solder, which also contributes to the cost of ownership. A larger system provides greater flexibility. It can not only handle larger boards, but it can also handle multiple smaller boards conveyed side-by-side to increase throughput. A prospective buyer may consider production throughput by calculating number of boards through a total cycle time from start to finish varying from 2.5 to 4 minutes from flux to solder. Laminar wave produces a very smooth laminar flow of solder much like a waterfall. This is the most widely used type. Turbulent wave sends solder up into the board with a highly turbulent wave used for thru-hole components such as pins with long legs that are fairly closely positioned, and for denser components. The turbulent wave helps to wick off excess solder to reduce icicles or bridging. (“Wicking” means pulling solder from the component’s stem into the component joint). Some machines are available with dual pots that can be used independently or together on the same board. 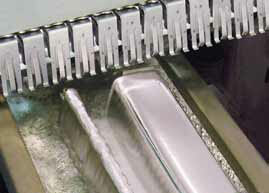 SMD components are often processed in a turbulent wave machine. Based on the machine’s control system, a wave is created by a high pressure chamber pushing solder out through the solder nozzle. A chamber holds the nozzle, pump motor that drives an impeller inside the pressure chamber. The conveyor that holds the board attacks the wave at a 7 angle, and makes contact on all components only for a very short time, then exits the wave. The solder pot size is determined by wave size, the smallest holding around 100lbs of solder for a 7”-8” wave width, up to 2400lb of solder for a 24” wide wave. Since solder is costly, the size of the machine contributes to the cost of operation. Also, solder running in a hot wave is susceptible to oxidation and depletion so all these factors add cost. Inerting the area with nitrogen at the point of contact will produce a better quality joint and eliminate the possibility of a cold solder joint or oxidation. Nitrogen also helps to cut down on dross, which is defined as solder that builds up enough oxidation or flux residue to render the solder useless, somewhat like slag. Contact on the component by the solder wave only takes place in seconds and once passed, cools almost immediately. Foam: A bath or pot that is usually as wide as the wave. The flux is poured into the flux pot, and an aerator in the pot creates foam which is applied to the thru-hole component and board. Spray: A high pressure container holds flux which is sprayed on the board by an oscillating spray head to cover all the components and the entire board. Foam fluxing tends to be less expensive and easier to maintain than spray. The downside is that this will cause evaporation if it’s not contained, and the flux will degrade more quickly. Foam systems are low cost to operate, and easy to use and maintain. Spray flux is contained in a high-pressure chamber which eliminates evaporation or degradation. However, spray systems are much more expensive, they’re difficult to set up, and require daily maintenance. They also involve a higher learning curve because it needs to be customized for each different board configuration. Flux requires activation by heating, so any wave system requires a preheat station enclosed in a conveyorized chamber, where preheat temperatures reach 140-175 C. Both the components and the board are pre-heated to eliminate thermal shock during the wave. Convection, which applies more even heating. Many preheaters are available with a combination. Convection is typically used in a no-clean flux environment, which provides a dry surface and eliminates post-solder cleaning. There are many variables in every system, so it’s very important to discuss your needs with a vendor partner to determine what’s best for your situation. This arrangement is usually tied in to a total PC board assembly line, where the conveyor simply moves assembled boards from the assembly stage through the Wave Solder machine and on to cleaning, finishing and other secondary operations. There is no manual interference at the solder machine; it’s a totally hands-off operation from beginning to end. Wave machines that run this way are usually very expensive and are used in high-volume repetitive operations. SMEMA (Surface Mount Equipment Manufacturers Association) defines uniform specifications for in-line systems to assure that all the operations in an assembly environment transfer boards seamlessly from one machine to another, regardless of the manufacturer, machine model, etc. This system uses titanium fingers or clips to retain and position the boards as they move through the wave machine. Boards are loaded onto the conveyor by hand and removed by the operator on the other side. A palletized carrier is used to hold the circuit boards (which may include multiple boards) and the entire pallet is loaded onto the Wave solder machine. This is a batch process rather than an in-line system. The pallets are usually a fixed size according to the wave capacity (width and length). Pros: Good support for odd-shaped boards or thin boards that could warp otherwise; can be customized to hold unusually shaped boards, or multiple boards; very easy to maintain pallets and fingers because everything can be done outside the machine; pallets don’t rely on a set of fingers internal to the machine that would require shutting it down for maintenance. Cons: Boards must be loaded manually into each pallet and then into the machine. There are a number of companies that specialize in designing and manufacturing custom wave pallets. Following are some highlights on pallet features and design options. The Wave Solder machine vendor you choose should be able to guide you in the selection and use of a proper pallet device. Process requirements, based on IEEE, IPC or other standard, will usually dictate the type of flux to be used in a particular process. IPC standards, such as J-STD, are used in the electronic assembly/manufacturing industry. Among other things, this standard dictates the type of solder, materials and processes to conform to specific specifications. If a highly active acidic flux is used, it will often leave a residue if not cleaned in process, whereas a ‘no-clean’ flux is burned off during pre-heat and doesn’t usually require cleaning after wave soldering. For no-clean fluxing systems, flux should be completely dry prior to its entering the solder wave. Many wave solder systems today using no-clean flux will include an extended preheat time (that is, a longer preheat travel distance) for activation, to ensure completely dry boards and provide an effectively clean board. The solder flux manufacturer will provide these recommended specifications. An air knife is used for removing excess flux by blowing it off the bottom of the board before entering the wave. It is usually used with foam fluxing methods but can also be used with spray fluxing. 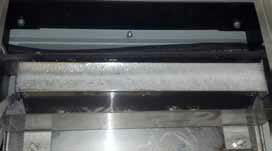 Pros: Eliminates most post-wave cleaning; returns excess back to the flux reservoir to conserve material. Cons: Adds a little cost but saves on post-wave manual cleaning. Typical cost range: Usually runs less than $1,000 as an add-on to a Wave solder system. 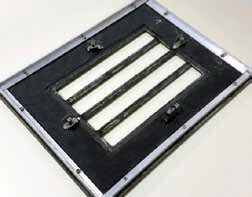 This is a cleaning system for finger-type or board edge conveyors. It sprays a solution onto the conveyor just before new boards are loaded. The system includes an alcohol detergent solution along with brushes. Pros: Reduces maintenance labor and downtime caused by flux residue buildup. Cons: Flux is a fairly sticky substance and can cause production problems if not dealt with regularly. Typical cost range: Usually adds between $1,000 – $2,000 to a Wave machine purchase. 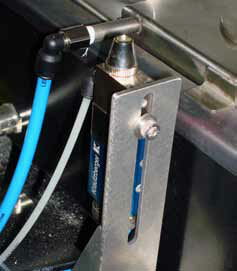 Inerting systems are used to introduce nitrogen during the soldering process. Nitrogen is contained within the solder pot by a hood to reduce oxidation in the pot and in the critical moments while soldering the boards. Nitrogen inerting is recommended for lead-free solder, which will oxidize rather quickly otherwise and can adversely affect joint quality. Nitrogen is by far the most commonly used gas in an SMT application. Pros: Ensures high quality joints to meet IPC standards when required. Cons: Adds a significant cost. Typical cost range: Can add up to $4,000 to a Wave solder system. On larger wave solder systems, the solder pot itself, when full, can weigh up to several hundred pounds. 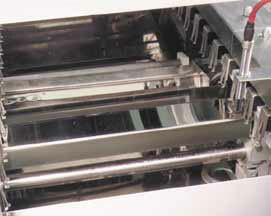 A rollout option simplifies maintenance by facilitating the removal and cleaning of the pot, which should be done weekly to remove solder dross in a typical production environment. This feature connects your wave solder system to a PC or networked computer to enable fault monitoring or data logging for QC purposes, or to allow the user to connect to the machine for remote control. Pros: A data logging interface is important for ISO certification and record keeping. 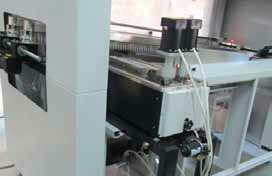 Click here to contact DDM Novastar for information on Wave Soldering or other machines. Download the PDF: "Selecting a Wave Soldering System"